If there’s anything I appreciate when it comes to food (and there are many things I appreciate when it comes to food), it’s the well-thought out tasting menu. A while back, I had an opportunity to partake in the tasting menu at Degustation, and I wasn’t disappointed. Happy Tuesday, Noshers! Hope you’ve had a great start to this week. How was your weekend? I had a lovely time at Ramp Fest (stay tuned for my re-cap post!) and got to enjoy the amazing weather. I feel like Spring is finally here! Our instructor telling us all about leeks! A few weeks ago, I had the fun and delicious experience of trying the tasting menu at L’Atelier de Joel Robuchon. I had heard many good things about this place, and Chef Robuchon has restaurants in London, Paris and Las Vegas, in addition to the NYC location. Tasting menus are my absolute favorite way of dining. Multiple courses of one or two bites that distill the very best of flavors and textures – and by the end of the meal, you are surprisingly stuffed. 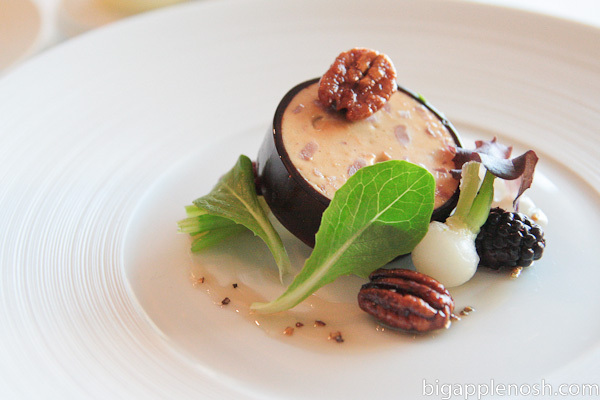 As with my tasting menu experience at Per Se, there’s not much more I can add in my commentary except that this meal was thoroughly enjoyable – I will let the restaurant menu descriptions stand for themselves!